As a parent I was very hesitant to bring any videogames into my home. The media is riddled with news, studies, and polls that argue against allowing children to play videogames, especially ones that depict violence in a stylized way. The underlying current seems to be that videogames retard development in important areas and influence impressionable children in negative ways by introducing them to images, themes, and situations they aren’t prepared to assimilate. My son is old enough now, though, that when he sees a Wii commercial on TV he knows what it is, and, more importantly (in his opinion), knows that he wants it. My spouse and I had a discussion about it and we decided, against my initial position, to buy a Wii for the house (my spouse can be very persuasive). We agreed that since we would have control over which games our son played, as long as we were careful about which titles we bought, the Wii could actually be an educational and fun way to spend play time every once and awhile. At any rate, the Wii has been a huge success in our home, and I’m glad we invested in it. I think a mistake a lot of parents make with videogames is thinking that it is a way to keep kids out of their hair and that videogames are something kids can do alone. If you are thinking about getting a console for your home, let me first assure you that it can be a great way to bond with and help educate your child. But I will also say that videogame time should be a parent-child activity, just as playing outside or arts and crafts should be. Remember the way your child won’t stop pestering you about cooking while you’re cooking? They do this because they are curious about the way the world works, and want answers. When your child is playing a game, ask them questions about it. Asking your child questions about what is happening onscreen, why it is happening, what they expect to happen next, and what happens when they do this or that will contextualize the events of the game and will help develop an understanding of narrative and cause and effect. Also, when your child meets a goal in the game or completes a level, try to ask questions about what they learned from that level, and ask them to retell what they did in the level. This will help with problem solving and memory skills. As great as questions can be, there is no substitute for your engagement with the game your child is playing. Joining in can be a great help in instilling a sense of cooperation and/or competition in your child. Furthermore, playing with your child gives you more opportunities to quiz your child over what is happening, and will give your child the opportunity to suggest solutions to problems. While playing, ask, “What should we do?” in puzzling situations and foster your child’s leadership abilities. One of the dangers of videogames is that children tend to neglect other kinds of play. While you are playing with your child, let them know how long you will be playing, and what you will be doing afterward. It is crucial to balance your child’s development in other areas by playing sports, making art, and other things, so don’t let videogames monopolize all the play time. If you set limits and incorporate other activities into a day, giving your child a rich, broad spectrum of things to do, videogames will just be one of many things, instead of the only thing your child wants to do. Speaking from experience, I know why parents can be hesitant to buy a videogame for their children. 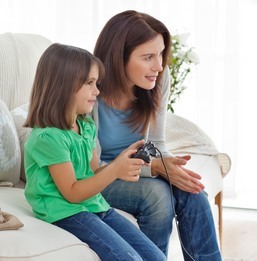 But, as with most things, if you play with your kids and play in moderation, videogames can be a great way to bond, teach, and nurture your children. LOL, well you can at least try and set goals. I think that is important.